This page will explain how to print individual or batch patient mailing and appointment labels from the scheduler. Label Options can be found under Tools, Options, Labels. These options can be changed to affect how the labels are printed. Click here for more information. To set a default label printer in TRAKnet, click on your User Name in the top right corner of TRAKnet and click Manage Printers. Choose a printer from the Labels dropdown menu. Please note that Windows 10 users may experience their default Windows printer changing after a label is printed; To prevent this from happening, follow the instructions here. To print a mailing or address label, right click on on appointment in the scheduler and click either Mailing Label or Appointment Label. The label will print to the default printer based on the Label Options settings. 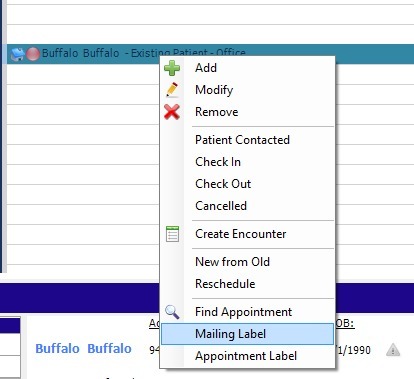 To print the entire schedule's mailing or appointment labels, click the Print button in the top right corner of the scheduler and select either Print Mailing Labels or Print Appointment Labels.